Just a few days after surgery that restored movement to her legs and arm, Kathy McGurr of West Milford no longer risked becoming a quadriplegic. A mother of three young children, Kathy McGurr, 40, of West Milford was on her way home to pick her daughter up from the bus stop. She parked her car, got out of it … and watched it roll backwards with her one-year-old daughter and three-year-old son in the back seat. She quickly reached in to make sure the car was in park … when it rolled again … this time on top of her, dragging her down the driveway. Luckily, her neighbor and her babysitter’s mother were nearby. They heard her screams and quickly called 911. With limited feeling and no movement in her legs – and only partial arm function – Kathy was taken by ambulance to Morristown Medical Center’s Trauma Center. There she met Dr. Charles Stillerman , a neurosurgeon at Atlantic NeuroSurgical Specialists (ANS). Fellowship-trained in spine reconstruction/stabilization and spinal cord injury, Dr. Stillerman knew he had to operate immediately. 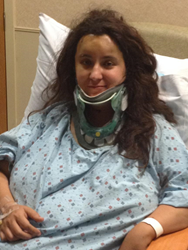 Kathy’s neck was broken and dislocated – as was her spine. She was at risk of becoming a quadriplegic. Kathy was rushed to the operating room where Dr. Stillerman restored her cervical spine to normal alignment and removed the bone and disc fragments that were compressing her spinal cord. Her fifth and sixth vertebrae were then stabilized and fused. A few short days later, Kathy was moving both of her legs and showing significant improvement in her arm strength. At that time, Dr. Stillerman performed another surgery using small screws interconnected with rods to add support to the back of her neck. Today, Kathy continues with her physical therapy – and she sees progress every day. “It’s amazing,” she adds. “In the hospital, I could only grip with my right thumb and pointer finger. Now I can hold 5-8 pounds. I’m walking and doing everyday tasks – like brushing my teeth and using a fork. I’m reading to my kids, feeding them and enjoying time with my husband. I am so grateful I can do these things again. For more information on life-saving spine treatments and ANS, visit http://www.ansdocs.com or call 973.285.7800.